Improving your soil is one of the best investments you can make toward a successful landscape. One common ailment of most western soils is that they are low in organic materials and have a high pH, meaning that they are alkaline. High alkalinity reduces essential soil elements needed for proper plant growth. Many soils around the built environment also suffer from compaction created by foot traffic, auto traffic, and machinery traffic during construction. 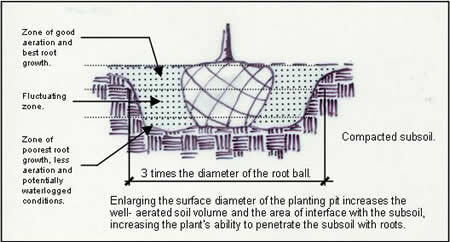 Compaction restricts the movement of air and water which is essential for good root development. 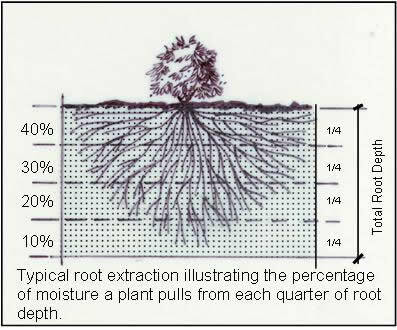 Good root development is a key factor in the ability of a plant to withstand drought conditions. Adding an inch or two of compost, peat moss, or aged manure rototilled thoroughly to a depth of six inches will help to improve the soil structure and moisture-retaining capacity while buffering the soil alkalinity. Another common problem with soils in our area is that soils are too sandy or too heavy with clay. To help alleviate this problem use the same approach. Organic material in clay soils will improve the soil’s ability to release more water to plants and will allow air movement. The same amendment in sandy soils will help it to hold water for longer periods of time. Remember that organic material such as in any soil is the primary source of nutrients to plants. The addition of aged organic materials such as compost, aged sawdust or manure also “inoculates” the soil with colonies of beneficial bacteria. These bacteria help to speed the decomposition rates of organic materials in the soil. Over time this process actually “grows” good soil. When planting large trees dig the tree hole 3 times the diameter of the root ball and exactly as deep as the root ball. Set the root ball on undisturbed soil at the bottom of the hole. This will prevent settling of the root ball. Do not amend the backfill. Contrary to popular belief, amending the backfill will encourage roots to stay within the planting hole rather than expanding outward into native soils. The hole is dug 3 times the diameter of the root ball because the loosened soil around the root ball will allow better movement of air and water, which stimulates root growth to explore the native soil surrounding the tree hole. Many native plants do better with no soil improvements. 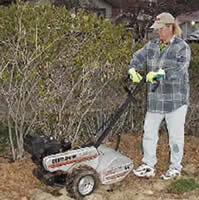 Use amendments only with appropriate non-native, adapted plants. Typically soil amendments should be focused in the High Water Use Zone and Moderate Water Use Zone. Soils in turf areas, especially bluegrass, should always be amended.